Are you a High School or College Student? Do you love playing volleyball or coaching volleyball? Join USYVL as a volunteer! We are always looking for coaches and assistant coaches for our league sites. 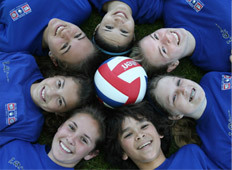 You can fulfill your school’s “Community Service Hours,” while doing something you love….coaching volleyball! Students who volunteer with USYVL can receive up to 40 community service hours. Volunteering as an assistant coach for USYVL is a great way to fulfill high school requirements or community service hours that students may need to complete. The weekly time commitment for volunteers is generally three to four hours per week. If you love playing volleyball and enjoy working with kids this is a perfect opportunity to give back to the community. If you are a high school student or know someone that is interested in volunteering with USYVL for community service hours, click the button below to sign up or click here to view the volunteer registration form. Time Commitment: The estimated hours to fulfill the duties is generally 2-3 hours per week. 3)	Submit a Volunteer Form so that USYVL can conduct a screening process.